For a truck enthusiast, there is nothing better than spending time in your pickup truck on the open road. At Magnum, we are truck lovers ourselves. We understand that our customers range from using their trucks to commute to their job, to playing a key part of their work life. Regardless of how you use your truck, a headache rack can add even greater functionality as well as some serious style. First and foremost, our racks provide additional safety for a driver. The rack is an added layer of protection between cargo in the truck bed and the driver in the cab. Magnum racks also provide protection for the cab window by preventing sharp items from directly scratching the cab window. A truck rack also allows drivers to secure items to the rack itself. Most truck racks are compatible with toolboxes and tonneau covers so you aren’t forced to choose between the rack and other accessories. High Pro – Sits slightly above cab height. The High Pro shares the height of the Standard model and the lights from the Low Pro to create a functional rack with the Magnum style. Standard – Sits slightly above cab height. The Standard headache rack finds the balance between appearance and functionality. A great fit for professional contractors who need a rack with a rugged, modern design. Unlike steel truck racks, Magnum’s all-aluminum racks will not rust over time. Explore additional information on the argument for aluminum versus steel in the auto industry today. 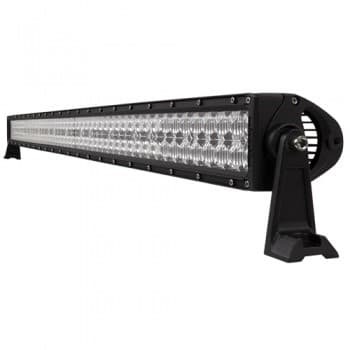 52″ LED Double Row Light Bar – This heavy-duty light bar provides 20,000 raw and 13,489 effective lumens while drawing a meager 17.6 amps from your system. The corrosion-resistant aluminum housing and adjustable mounting bracket provide a strong base. The mounting hardware and feet are included with the LED light bar; wiring is the purchaser’s responsibility. Round Utility Flood Light – If you’re looking for a strong and compact source of light, our LED 4″ Round Utility Flood Light delivers. 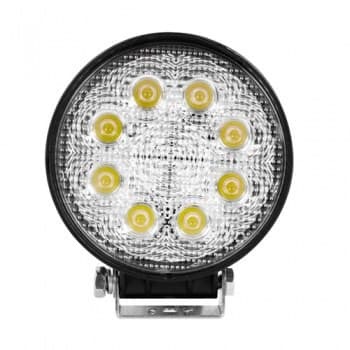 This light puts out 930 effective lumens and draws only 1.3 amps. It’s also functional with both 12 VDC and 24 VDC electrical systems. Learn more about this light now. 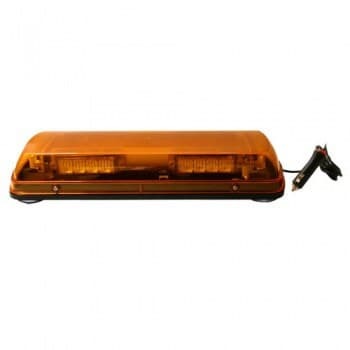 LED Warning Light Bar -Magnetic Mount – This light delivers high visibility and is easy to use. It’s the perfect option for truck drivers who need to move lights between vehicles, as the lights are mounted by strong magnets. 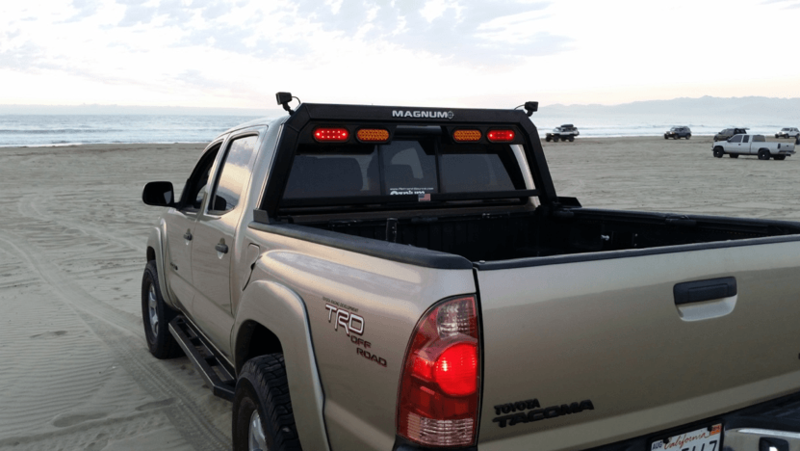 The LED warning light can attach to your Magnum truck rack, or directly to your vehicle. Traditionally, a truck rack’s primary purpose was to prevent heavy or sharp items in the truck bed from going through the cab’s rear window. These days, headache racks have evolved to serve a variety of different functions. Truck racks not only allow drivers to be safe while hauling equipment, machinery and materials but they also give a vehicle an eye-catching appearance. Modern headache racks also provide utility by allowing drivers to add additional lights to their truck. 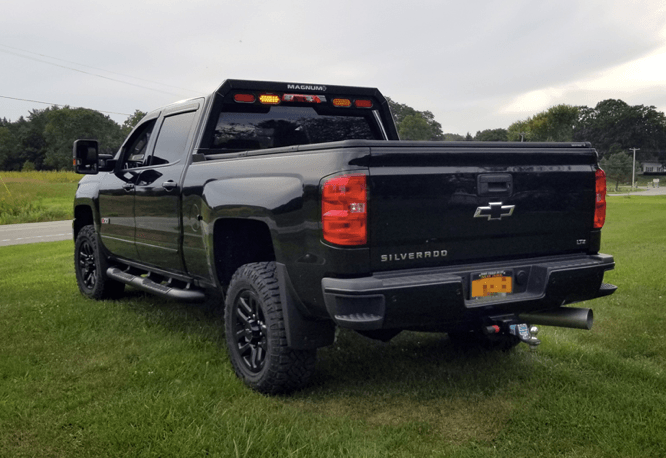 With a variety of truck rack options available, truck enthusiasts are able to match their rack with their personal needs and style. ← Why Are Truck Racks Called Headache Racks?